The Westminster Labyrinth is an idea that originated with the Sunday Morning Live class study of spiritual practices. Churches of many faiths across the United States are rediscovering this ancient spiritual tool. The best-known example of the labyrinth is in the floor of Chartes Cathedral in France, which was rediscovered after 350 years of obscurity. To walk the labyrinth is a spiritual experience, not an exercise. It is a way to escape the busyness of our daily lives, and by quietly meditating and praying, seek God’s presence and guidance. Just as Jesus needed to withdraw from the crowds to pray and meditate, we also need times of release from our daily concerns, times to be quiet and listen for God to speak to us. If you may meet other walkers along the path, pass in silence, remembering this is a time of solitude. 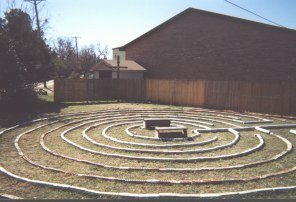 This is the first Christian labyrinth in Abilene, and it is open to all people for the purpose of Christian prayer and meditation. This is one more tool in our growth and maturity as seekers of a life long walk with God. Like so many of our experiences with Christ, it is something we share with others and at the same time is very personal. The Westminster Labyrinth was incorporated as a “Sacred Path” for the use and benefit of all like minded seekers.